Beta Toilets from Beta Contech are manufactured and customized to meet the precise needs of simple to complicated projects with its top-notch finish, quality of material and within a timely delivery. A complete solution with a wide selection of colors and textures are available.Our panels are manufactured from Black Phenolic covered with HPL panels to withstand harsh utilization conditions, while accessories come in a stainless steel finish; Gravity hinges, indicators Rosette, Lock set, Knob, Coat Hook, Pedestal leg, tissue holder. Compact Laminate is a high-pressure, load bearing decorative laminate which is resistant to atmospheric and chemical agents. it has an inner core of celluloid fibers impregnated with thermosetting resins, and a surface coating of the same fibers, decorated and impregnated by primary amino plastic resins. It is resistant to extreme temperatures, chemicals, stains and scratches. To cut Phenolic always use well-sharpened, hard tools (tungsten carbide /Widia) . Cool down the tool at all times during the cutting to prevent heating. • Table-mounted saw: face the visible side of the panel upwards. • Hand-held saw: face the visible side of the panel downwards. •For clean cut edges of the exposed surface, adjust the saw blade so that it shows up around I - 2 cm from the panel sawn surface. • Extremely strong, impact resistant and flexible. It will not become hard and brittle, or soft and elastic. • Staining, Graffiti and Bacteria growth: Top layer Coated with melamine resin of high concentration. No pores on top Surface hence non-absorbent. • Cigarette Bum: Passes highest grade "5" as per lSI Specification. i.e. burning of cigarette leaves no visible mark on the compact. The divider walls, Pilasters are affixed to Full length aluminum "U" profile in our Standard installation. We DO NOT use Simple "L" angles. • Hospitals / Infirmaries / Clinics: medical equipment tables, food trolleys for patients. hospital kitchens. interior cladding for the walls of rooms requiring high degree of disinfection. • Nurseries / Schools: Classroom tables and seats. • Airports / Train stations. • Kitchens: food preparation tables and skin surroundings. 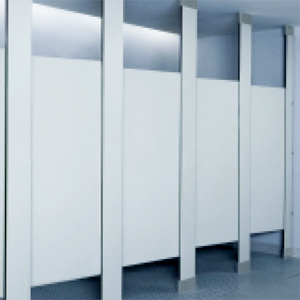 • Bathrooms and Fitting rooms: due to these boards moisture resistant traits.